The USGS have been exploring how changing climate conditions affect lake temperatures and water in Crater Lake, the deepest lake in the U.S. and one of the clearest in the world. Models show that atmospheric warming could disrupt the deep mixing process in the lake. As air temperatures rise, the deep lake mixing events will likely become less frequent. Under the least severe warming scenario, deep mixing will occur on average once every three years by 2100. Under the most severe scenario, deep mixing could stop completely. 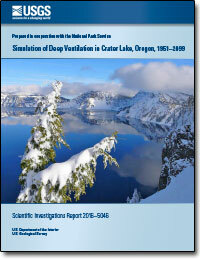 The 1DDV model was used to simulate daily water temperature profiles through 2099. All future climate scenarios projected increased water temperature throughout the water column and a substantive reduction in the frequency of deep ventilation events. The least extreme scenario projected the frequency of deep ventilation events to decrease from about 1 in 2 years in current conditions to about 1 in 3 years by 2100. The most extreme scenario considered projected the frequency of deep ventilation events to be about 1 in 7.7 years by 2100. All scenarios predicted that the temperature of the entire water column will be greater than 4 °C for increasing lengths of time in the future and that the conditions required for thermobaric instability induced mixing will become rare or non-existent. A Sentinel 2A image of Crater Lake National Park in Oregon. Taken on May 28, 2016. Credit: European Space Agency. New Maps/Report by USGS Scientists Show Underwater Features of Crater Lake in Unprecedented Detail Ancient lava flows, volcanic cones and landslides are some of the features below the surface of Crater Lake that are depicted and explained in a report available from the U.S. Geological Survey, Department of the Interior. New, detailed images of the bottom of Crater Lake in Crater Lake National Park, Oregon, are giving park managers and scientists a new look at a previously hidden place. The bottom of Crater Lake, in Crater Lake National park, will get a thorough going over during the next two weeks, when scientists from the U.S. Geological Survey and the University of New Hampshire will map the lake’s bottom, using the latest multibeam sidescan sonar technology.